Municipal Board/Commission: Minneapolis, Minnesota (City Board of Public Welfare); ?19? to 19?? Municipal Board/Commission: Minneapolis, Minnesota (City Park Board); 19?? to 19?? State Board/Commission/Council: Metropolitan Council of the Twin Cities Metropolitan Area's Committee on Highway Planning, Minnesota; 19?? to 19?? Military: United States Army; 19?? to 19?? He was the first Minnesota Republican Governor to be denied his party's endorsement for reelection when Allen Quist was given the endorsement in 1994. He had been a member of the Democratic Party in his early years and switched to the Republican Party in the early 1960s. He was a member of the Independent Republican Party during his legislative service. He was a member of Lynn Hurst Congregational Church. Religion provided by the MN Legislative Manual, 1975-76. Catholic Bulletin, 3/21/1975 says Protestant. 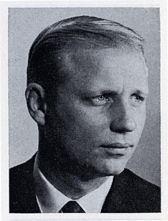 Arne H. (Helge) Carlson. Biographical Information from the Minnesota Historical Society's Governors of Minnesota.